This summer we got our first taste of travel in Eastern Europe. Although we barely scratched the surface of the region during the eight-week trip, we crammed as much culture, history and delicious food into our adventure as we could. Our journey took us through UNESCO towns and turquoise seas in Croatia to sedate Slovakia and the heaving capital cities of Budapest and Prague. So, how much did our Eastern Europe trip cost us? We were on a mission to travel Eastern Europe on a budget after our plans to work in Spain fell through. That meant getting around by bus and public transport, eating plenty of supermarket lunches, staying in the cheapest Airbnb places we could find and taking advantage of free activities. Our Eastern Europe itinerary began with a trip to Croatia where we spent over five weeks before moving on to a fast-paced tour of Budapest, Bratislava and Prague. Here’s a breakdown of how much we spent in each country. Our trip to Croatia started in Dubrovnik where we spent three days before heading down the coast to Split. We stayed in an apartment for five weeks and rented a car with a friend for a few days to explore the Dalmatian coast. On these trips we discovered seaside towns like Primosten, the Red and Blue Lakes of Imotski and crashing waterfalls at Krka National Park. 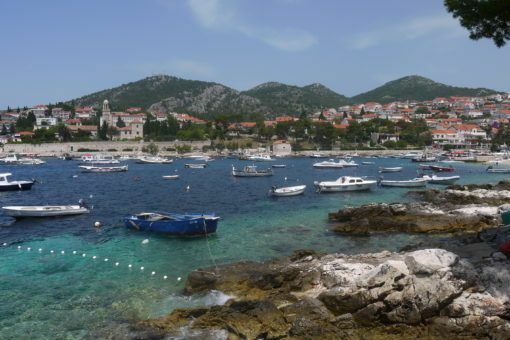 We also island hopped over to Brac and Hvar. Most of our sightseeing was free with the exception of walking the city walls in Dubrovnik, which cost £12.67 per person; Krka entrance fees were £11.50 each and it cost £2.10 per person to go up Split tower. We used Airbnb and got a big discount for staying in our Split apartment for over a month, which brought our daily accommodation cost down to £17 a night. We loved having our own space to catch up with work, relax and cook. The fact that we were able to shop at supermarkets and eat in meant that our daily food costs came to under £9 for two people. That includes plenty of pastries from delicious Croatian bakeries as well as going out to Croatian taverns and pizzerias for dinner. Transport-wise, we took a few taxis but mainly relied on buses to get around. Local bus journeys could cost around £2.50 per person into Split Old Town while the coach from Dubrovnik to Split cost £14.40 each. The price of car hire for four days was split with a friend and our share came to £90, including petrol, tolls and parking. The first ferry we took to Brac Island was pretty cheap at just £6.75 each for a return trip, but by the time we visited Hvar it was peak season so prices shot up to £19 per person. Miscellaneous costs included £22 for my contact lenses. 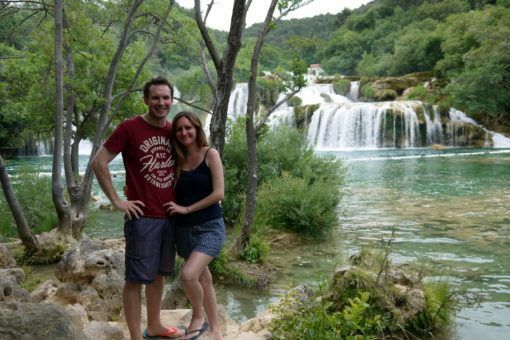 You can read a more thorough breakdown of our Croatia travel costs in this post. We arrived by coach in Hungary’s Capital Budapest, which we quickly fell in love with. Our week in Budapest was action-packed and we walked miles around the city discovering World Heritage Sites and religious buildings, geothermal baths, squares and parks. 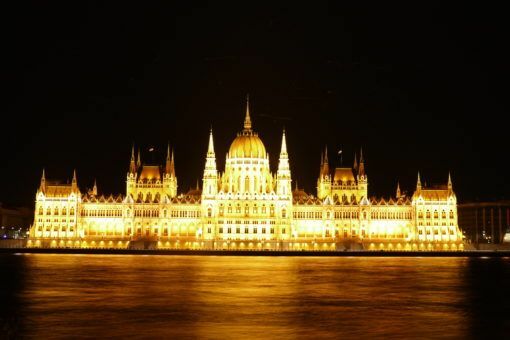 We went to museums and hiked up to scenic viewpoints, we explored the castle district and walked along the river at night to see the Parliament building lit up. At the Terror Museum and in the Jewish Quarter we learnt about Budapest’s sad, turbulent past. We stayed in an Airbnb room on the outskirts of the city for just £11 per night. It was basic but our host was lovely and gave us a free breakfast every day. We found some cheap lunches at the Central Market, where we bought a load of fruit and some pastries for just £3.50. In the evenings we mainly ate in the Jewish Quarter and found some cheap, tasty falafel meals for £4 each. While sightseeing we spent £8.50 per person to visit the Dohany Street Synagogue, the Terror Museum cost £5.30 each and a trip to the Szechenyi Baths was £25 for two. We got around Budapest by tram and bus, a block of 10 tickets cost £8. I soon realised that we didn’t need a whole week to explore Slovakia’s Little Big City. 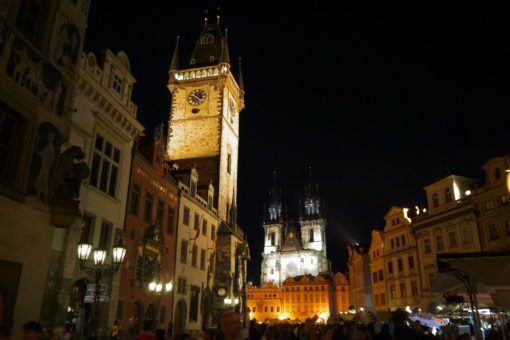 It took us just a couple of days to walk around the old town and take in its famous sights on foot, including squares, statues, churches and clock towers. We were glad for a rest after our hectic week in Budapest though, so we enjoyed taking it easy and soaking in the atmosphere of this charming, cobbled capital. There was also time to take a day trip to Vienna and were pleasantly surprised to find a grand city jam-packed with sights. Again, we stayed on the outskirts of Bratislava in a studenty house which was a bit rough around the edges, but cost just £15 per night. Single bus journeys in and out of town cost £0.75 per person and took around 20 minutes. We found eating out in Bratislava more expensive than Budapest, at around £15 for a meal for two, so we ate breakfast and cheap dinners of bread, cheese and fruit from supermarkets. Sightseeing was ultra-cheap as we paid just £3.40 per person to go to Devin Castle and £2.10 each to climb the town hall clock tower. Our daytrip to Vienna didn’t break the bank either, costing £39.12 in total. Prague was our favourite Eastern European city for so many reasons. I was instantly captivated by the Gothic architecture, energy and delicious food, the cobbled streets filled with music, the atmospheric castle, bridges and quirky statues. We spent five days in Prague zipping from one sight to the next and spent one morning at the Bone Church in Kutna Hora. Our Prague Airbnb room was lovely and cost just £18 a night. Our host also sold us monthly tram passes which meant we could both get around the city for less than £2 a day. Most of our sightseeing was free except £4.65 each to go up St Vittus tower, and £8.45 per person to visit the Bone Church. The food in Prague was delicious and we splashed out on some dinners with my friend Jo at veggie restaurants and pubs. Supermarket lunches were cheap and Chimney Cake snacks cost just £2.17. A pint of Pilsner was cheaper than water, at less than £1 per pint! Here’s a breakdown of our total Eastern Europe travel costs for eight weeks. Croatia came out cheapest, but this is mainly because we rented an apartment there for five weeks and spent some of our time working rather than exploring. Generally, we found that actual travel costs in Croatia were similar to Hungary. 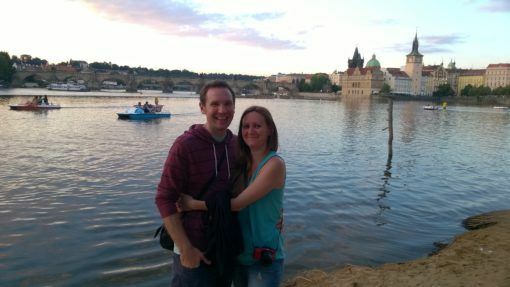 Prague was our most expensive country, but we did splash out more on delicious meals and considering how much we loved the city, we thought that it was great value for money. 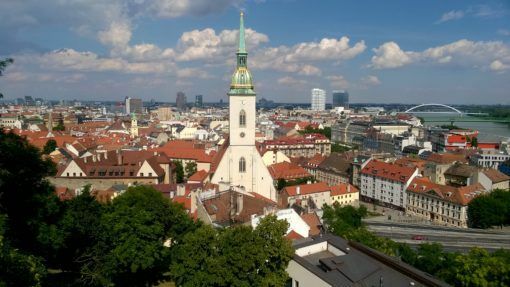 When we compared our Eastern Europe trip with our overall travel costs, we found that it only cost on average £100 more per month to travel in Eastern Europe than in South-East Asia. 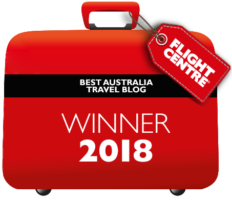 True, we do get more for our money in Asia and tend to stay in nicer places and eat out more often, but I still think we proved that Eastern Europe can be travelled well on a budget. 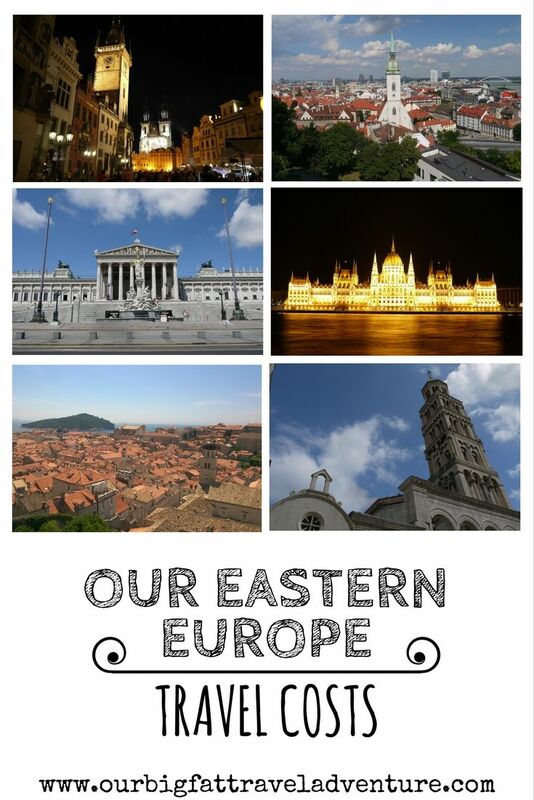 What do you think of our Eastern Europe travel costs? You have done incredibly well managing to keep costs down, getting value for money and still having a lot of fun. I can’t believe how cheap it is to travel by bus between those countries? Are the buses confortable? In any case for those prices it doesn’t matter? Hi Gilda, I couldn’t quite believe that the buses were so cheap either when I looked back at the prices! The buses were fine and usually just took a few hours, apart from the very long journey between Croatia and Budapest. I would definitely bus between countries again! 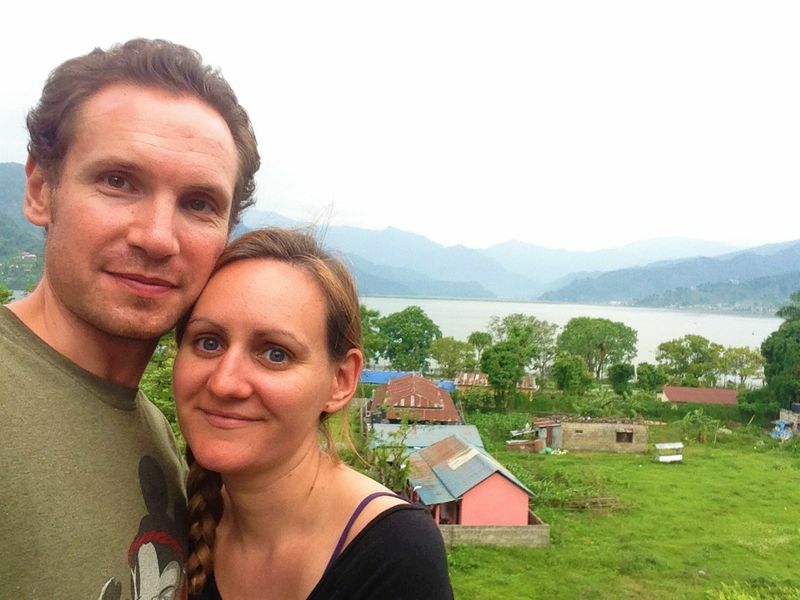 You both sound like you’ve been on amazing adventures, very inspiring! Just wondering what you used to organise buses around Eastern Europe, particularly between Croatia, Albania and Greece? Thank you in advance! Hi Danielle, thanks for reading. We used GoEuro to search for buses. Have a great trip!